You will traveling to Romania anytime soon? This is a country that has quite a bit of tourism primarily because of a place called Bucharest. This is a city where many cultural events happen, festivals, and the nightlife is also extremely fun, depending upon the type of music that you like, whether you like to drink, or just have fun dancing all night long. It is possible for you to ride the Metro while you are there to go sightseeing, but it’s actually better to drive a car. Here’s an overview of what you can expect to do in Bucharest when you travel to Romania, and also how you can get a rental car in Bucharest for a lower price. 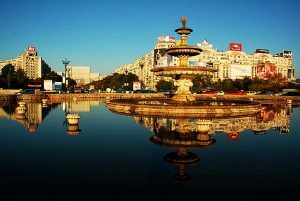 To start off with, Bucharest is the capital of Romania. It is also the largest city in that country. There are roughly 2,000,000 people, and is the financial epicenter of the country which also has artistic and cultural enigmas. It is actually one of the most important cities in regard to industry in eastern Europe today. It is a very wealthy city, and they even have their own stock exchange, with a very low unemployment rate. Over the years, it has continued to grow, and most of the people there are of Romanian descent. Let’s say that you want to travel to this country, traveling during the spring or summer is the best time to go. You will be able to see many buildings including the National Museum for Art, the Palace of Parliament and the beautiful countryside that you can see outside of the city. You can walk around, but it will take you quite a bit of time to get from place to place, which is why most people ride the Metro. However, you might be better off to rent a vehicle so you can drive to see the countryside in just a matter of hours. If you would like to rent a car in Bucharest, it’s very easy to do. More than likely, you should be able to get the best deal when you are booking a package deal when you’re coming to this country. There are many places that offer excellent package deals on the web, many of which will offer the car at a very low price. As long as you are willing to drive the car that they are including with the package, it will cost you very little, or even nothing, in comparison to how much you would pay for everything separately. Go ahead and book your vacation to Bucharest today. Promotor Rent a Car is here to offer you the best offers and best services also!